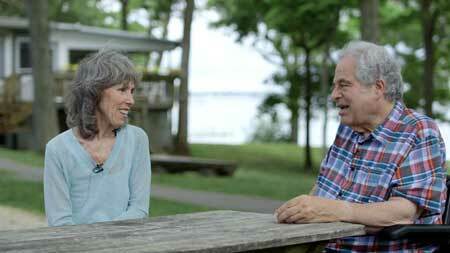 An intimate portrait of the great contemporary Israeli-American violinist Itzhak Perlman. It begins with a baseball scene: Perlman, crippled by polio since youth, emerging from a transport van at a baseball field with a NY Mets shirt on. It turns out he’s going to play the Star Spangled Banner, and he does so in royal style with his usual rich tone and a sweet melodic relaxation that characterizes so much of his playing. We get a few snippets of a rehearsal backstage in which Perlman kibitzes with his violin, making an exotic stew out of the familiar patriotic tune. It’s a variation, he chuckles. This familiarity and informality characterizes this collage-like portrait of Perlman which draws heavily on interviews with Perlman and his wife Toby interleaved with historic footage of Perlman throughout his career and contemporary footage of him engaging musically and otherwise in one context or another. It’s delightful, charming, intimate and has more to do with Perlman the person, the jokester, the husband, and the family man who also happens to be one of the best known violinists in the world. There are, to be sure, plenty of scenes in which Perlman is caught playing. Early on, and episodically throughout the film, we see him rehearsing a piano trio with two great Russian-born Israeli musicians, pianist Evgeny Kissin and cellist Mischa Maisky. We get enough of it to get a sense of these three greats making music together, but its capture is episodic and the result, though persuasive, is impressionistic. The charm and the bent of the film allow us to watch the three of them eat Chinese food and chat together after rehearsing. Interwoven are accounts by Perlman that give a sense of his upbringing as a violinist. I wanted to play the violin because I liked the sound, he says in a way that seems at once obvious and revelatory. His account of years of studying violin are funny, poignant and vivid. He paints a picture of growing up in a household in which his parents kept him practicing hard. Perlman recounts how much conflict was involved, and he also remembers his father saying You better get good at this because you’re not going to be earning a living as a baseball player. Says Perlman: It was a triangle of hell – me, my teachers, and my parents. Though the film captures Perlman as wryly honest about his rearing as a violinist, it also depicts a man who is constantly joking and lighthearted. That warmth and playfulness are demonstrated in one clip or another of Perlman’s playing, throughout his career in typical classical settings, or, in later years, in jazzier departures with adventures in Klezmer bands. We see historic footage of Perlman’s watershed performance of part of the Mendelssohn Violin Concerto on The Ed Sullivan Show in the early 1960s and get a sense of what a huge difference that made to his career. And we also get an account by noted Juilliard violin teacher Dorothy DeLay, on first hearing Perlman, falling in love with him and his playing. Perlman honestly embellishes by describing, along with his appreciation of DeLay, some of the complexities he encountered studying with her. Throughout the film, Perlman’s wife of many years, Toby, weighs in heavily on Perlman’s life and career, pointing out how difficult it was, early on, to get people who might promote Perlman to do so because he was crippled. She also describes vividly how, as a fellow teenage music camper, she fell in love with Perlman and allowed the relationship to mature over several years and through several other girlfriends before proposing marriage to him. The Perlmans’ rich family life is depicted, and, interestingly, shown during a Friday night which, as Toby notes, Perlman keeps for Sabbath observance, never performing but maintaining the time for family. There are clips of Perlman rehearsing Bach with the noted Argentinian-born pianist Martha Argerich, and, separately, in a rehearsal for a show with pop singer Billy Joel. Caught as well is a private account of the violin solo from the John Williams score of Schindler’s List for which Perlman is so well known. 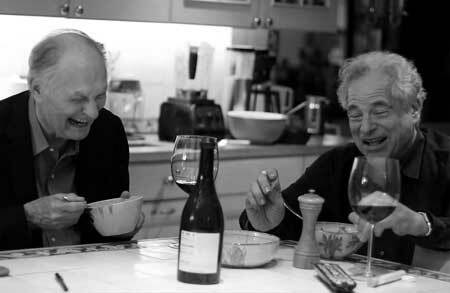 One of the sweetest interactions depicts Perlman at the dining room table with Alan Alda with whom he clearly shares a warm friendship. Alda reveals that he contracted polio as a child and they each, in light-hearted but compelling ways, give moving descriptions of their different difficult treatments as children. That this film is entitled Itzhak rather than Itzhak Perlman or Perlman is testament to its focus on the intimate, the personal and individualistic quality of this stellar musician’s bearing. Interestingly, this film contains almost nothing of professional musicological commentary on, or testimonies by fellow musicians about, Perlman’s playing. That’s not what this film is about. In that sense, the film withdraws from assessments of Perlman’s particular characteristics as a musician. Alternatively, it tries to paint a picture of him as a human being who happens to play the violin rather than as a violinist who also happens to have a life. The result provides an interesting and warm approach, shaped by contemporary footage shot by the filmmaker, but embellished thoughtfully with enough historic footage to give it dimension. Consequently, one would not rush to characterize it as an authoritative account of the work of this great contemporary violinist, but it is an engaging and persuasive personal portrayal, well worth seeing.